In this week's parsha, Parshas Behar-Bechukosai, the posuk (verse) appears, "Im bechukosai tei'leichu v'es mitzvosai tishmeru...If you follow my statutes and observe my commandments". What is this double wording, "my statutes and my commandments"? In the Torah, not even a single letter is superfluous, so it cannot be that the two refer to the same thing. According to Chazal, the ancient generation of sages, "bechukosai" gives over a unique concept: toiling in Torah. In fact, the gematria (numerical value) of "bechukosai" is the same as the Hebrew for "toil in His Torah". The Chofetz Chaim says that the fact that we are commanded to toil is a chiddush (novel idea), because every mitzvah gains a reward, and who ever heard of someone getting paid (a reward) for not finishing a project! However, in Judaism, to toil is not only worthy of reward, but it is the ikar (main point) of Torah itself. To learn and love Torah, to see the little things and let all of creation be an inspiration and lesson to us, that's the whole point. How can it be that we were so lucky to receive a way of life that grants us such a unique opportunity? We know from the Midrash that before HaKadosh Baruch Hu gave the Torah to the Jews, each nation of the world was presented with the option to received the Torah. However, each nation was told only the mitzvah that would prove to be the most difficult for them, so those who had a culture of stealing were told that they couldn't steal, and those that were very idolatrous were told only the commandment against idol worship. This caused each other nation to reject the Torah, unitl only the Jewish people were left, and we accepted the Torah without hearing even a word of the prohibitions. Rav Moshe Weinberger says that it doesn't necessarily mean that only the negative mitzvas were given, but these were the only ones that were heard. After hearing the entire Torah, the other nations were simply left with the stinging reminder of not being able to do this or that. They couldn't grasp the whole picture, and, in the end, turned away from G-d. The Jewish people, however, accepted it all, and received the precious mitzvah of being "amil b'Torah", to toil in the Torah. There was once a British poetry-reciting competition. Each contestant was given various poems to recite, and the last poem chosen for the gorup was the Twenty-Third Psalm, Kapittel Kof-Gimmel of Tehillim. "Mizmor l'Dovid, Hashem roi, lo echsor...A Song of David, G-d is my shepherd, I will not lack anything". When the last contestant finished reciting, the entire audience began clapping, and it was clear that he was the winner. Amongst the clapping and noise, a small voice in the back of the auditorium began to shout, "Excuse me, excuse me... may I try...", and as the audience parted, a small, old, Chasidishe man was revealed, and he made his way to the front. Expecting to end the competition with a laugh, the judges of the competition permitted him to recite the Psalm. At first he recited a few words, translated them for the audience, but then he immersed himself in what he was saying, forgetting those watching him. The audience, first amused, switched to joy, and soon found themselves crying at the emotional, all-encompassing presentation before them. When the Chasid finished, he made his way down the stairs and out of the auditorium. The contestant who had been declared the winner chased after the Chasid, stopping him as he reached the exit. "Here," he said, hading the Chasid the trophy, "this is yours. Clearly you recited the last piece better than anyone else. But tell me...how did you make such an impression?" The Chasid refused to accept the trophy, and simply said, "You recited very nicely, 'The Lord is my shepherd,' but I know the shepherd, he's a friend of mine, I toil with him all day." 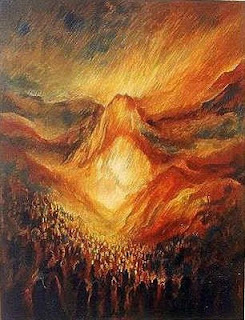 May we too realize the depth and importance of simply toiling in Torah, softening our hearts to know the reality of what is around us, and allowing ourselves to hear the truth about us, that we are all essentially precious, important, and holy, so that it will no longer be the concepts of Torah and G-d, but the reality, that fills our days. toiling in torah,, not that easy at all.